Ealing Council is toughening its stance against people who spoil the borough’s streets and parks by dropping litter, dumping rubbish, spitting and allowing their dogs to foul the streets. The council has teamed up with Kingdom Security to provide dedicated teams of uniformed officers in the borough. 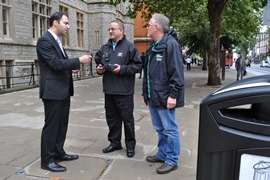 Kingdom Security will work with the council’s environmental enforcement officers, providing a high-profile deterrent and issuing £80 fines. Operating initially on a one-year trial basis, Kingdom Security is working at no cost to the council. Instead they will take a share of the fines they issue. It is the start of a wider, joined-up response to environmental crime in the borough which will see council teams working alongside the police and members of the public to improve the environment and public spaces. Kingdom Security are also working with Harrow Council which means that persistent environmental problems that spill over the two borough’s boundaries can be the focus of a co-ordinated response that solves them once and for all. Councillor Bassam Mahfouz, cabinet member for transport, environment and leisure, said: “We spend £4.5million each year cleaning up after people who feel it is ok, to litter our streets with rubbish, chewing gum, spitting or dog mess. Ealing residents are sick of seeing it and paying to get it cleaned up through their taxes. Officers will start patrols from Wednesday, 23 September. Residents can report littering and dog fouling online at www.ealing.gov.uk/reportit.